Windows in bathrooms and home spas provide homeowners with opportunities for a distinctive and enjoyable window. The process by which a satisfactory design for these windows is developed provides a good example of how a design for stained glass anywhere in the house can be developed. By describing how we arrive at the best design for bathroom windows, we hope you will come to understand the personalized process we use to arrive at the best possible recommendations for art glass throughout the house. 10. can calm you down. Furthermore, these windows can usually be installed without disturbing the frame or weather seal by laying the stained glass panel over an existing window. Some bathrooms are intended for use by guests. Other bathrooms and spas, such as those adjacent to master bedrooms, are much less likely to be seen very often by guests. We suggest you consider who is likely to use the particular bathroom or spa and what kind of mood or atmosphere you would like to create there. 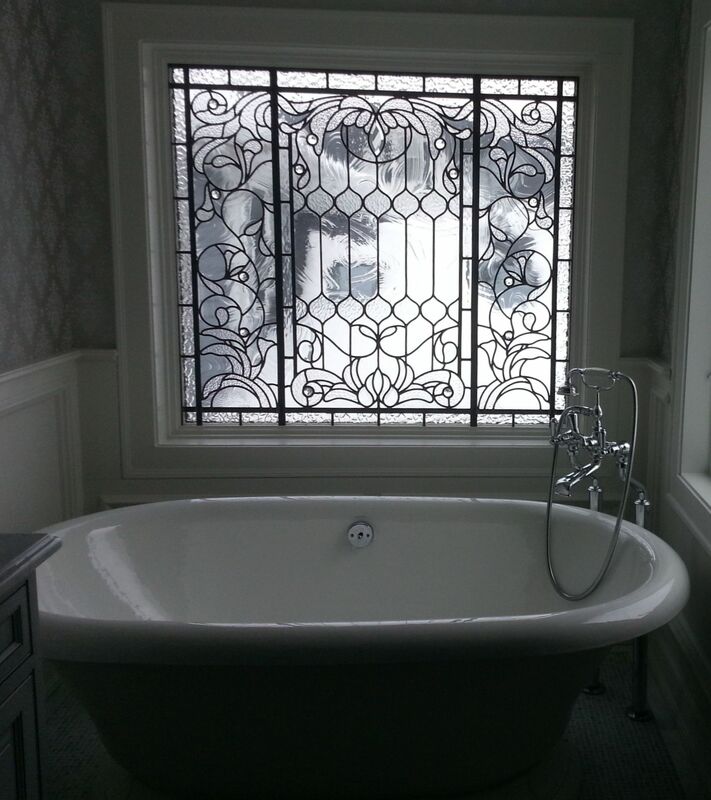 For example, for a window in a guest powder room you may prefer a window in a pattern of delicate flowers. Very genteel. However, for a window in a private master bedroom you may prefer a picture of a waterfall or tropical bird. Very exotic and romantic. There are countless possibilities. Since it is not practical to consider all of them, we suggest a few guidelines. It is an iterative process that will help you decide in which theme and format areas you would like us to come up with a design. Basically, we will narrow in on a design that will be just right for you. Among the most popular motifs for bathrooms are windows that look like pictures of something. The most popular somethings are flowers and water subjects, such as ponds, fountains, bouquests and garden paths. Other popular subjects for a bath are exotic birds and nudes, often standing or bathing in a stream, pond or waterfall. Designs with leafy branches, floral borders or garland, and ribbons and bows are also popular. However, even subjects like carrousels, animals, tropical fish or automobilies are possible. We have made windows featurings such things as squirrels, airplanes, company logos, Oriental carpet patterns and the Seattle World's Fair Space Needle. Literally, if you can imagine it, we can probably make it work for you. Don't be afraid to suggest something "crazy". We have found that even unusual requests can work out if the design is right and it is executed artistically. If you can decide on a subject, for instance, a floral wreath, then we can prepare some sketches or pictures for you to see which will help us narrow in on a design you can approve. Also, give some thought to what you would like your window to do. You can look again at some of the advantages listed earlier. Let us know what your preference is in these regards. For example, would you like to pick up an existing color in a counter top, tub, floor or wallpaper and emphasize it? Do you want your window to still illuminate the room or is other lighting sufficient? If the window has some transparent glass in it, sould people see in from the outside? What colors are your favorites and which would you like to avoid? What word or phrase would like to use to describe the finished window? Relaxing? Dressy? Exotic? Romantic? Victorian? Mauve? Underwater scene? Ancient Roman bath? Flower garden? Abstract? The more terms and preferences you can give us the easier it will be for us to narrow in on a theme and design you will love. We will also need to know what direction the window faces since this influences the amount and timing of the light on the window. Expect something beautiful. Expect a window you will take pleasure in viewing for many years. Expect something that will make your home even more enjoyable and that will be another highlight for your lovely home.